Three months after the fall of Tripoli, life inLibya's capital is slowly returning to normal. Businesses have reopened, and traffic jams are replacing the huge crowds in what is now known as Martyr's Square. Producer Jomana Karadsheh spent many long days and nights covering Libya's revolution. She returned to the country recently, and sent us a BackStory documenting some of what’s changed. After being held hostage for five days by Gadhafi gunmen in Tripoli's Rixos Hotel, Matthew Chance and producer Jomana Karadsheh were finally released, along with dozens of other international journalists. After the team left the Rixos, they talked about their experiences inside. What's really going on in Gadhafi's Tripoli? At first glance, "Mahmoud" would seem the perfect candidate to be a supporter of Moammar Gadhafi. He has prospered during the Libyan leader's 41-year reign, first as a professional and later taking care of his deceased father's businesses. But, as with many things in Tripoli, a first glance can be deceiving. "Ninety percent of the people in Tripoli hate Gadhafi," Mahmoud told me over sips of espresso at a corner coffee shop this weekend. "All his people do is tell lies. If anyone tells you different they are just afraid." CNN is withholding his real name for his own safety. On an almost hourly basis, regime officials and government minders tell foreign journalists that Tripoli is a stronghold of Gadhafi and that dissent has vanished in recent months. CNN, like other media here, is under severe government restrictions. But I recently managed to slip away from government minders to talk directly to several Libyans. And according to several eyewitness accounts, major demonstrations were held against Libya's strongman as recently as last week. And in the Souq al-Juma neighborhood of the capital, where anti-Gadhafi protests first erupted in February, the government's propaganda bubble is quickly burst. While international journalists including me were ferried by government minders to a pro-Gadhafi rally at Green Square on Friday afternoon, multiple sources tell CNN that several Tripoli neighborhoods were wracked by running battles between protesters and security forces. "They were protesting right around the corner. They streamed out of a mosque and onto the small square," said Mahmoud. "Almost immediately Gadhafi forces fired at them with live rounds." Mahmoud and other sources say that the group was several hundred strong. He claims that three people were killed and that the area was put under lockdown by government security. Other people in the area confirmed the death toll, but it is impossible for CNN to independently verify this account. 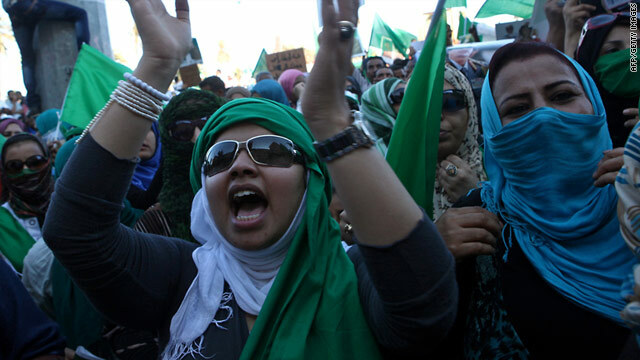 The government has repeatedly denied any anti-Gadhafi protests in Tripoli in recent weeks, including on Friday. A taxi driver in his 20s also said that he took part in one of the protests in Souq al-Juma on Friday. CNN is calling him Jamal - not his real name - to protect his safety. "We came out after afternoon prayers," he said, "we were unarmed and peaceful and they just shot at us." He says he a bullet grazed his arm. Jamal says that unlike the rebels in the East, they don't have easy access to weapons to fight. But he says, "I am not afraid. Even though we were unarmed, I am doing this for the future of my country." Another protest was fired upon in a seaside neighborhood of the capital, Jamal says, citing friends who said they were at the demonstration. Speaking to journalists in Tripoli is risky. Gadhafi's vast spying network means that almost anyone on the street could be an informer or worse. Residents of Souq al-Juma say that hundreds, if not thousands, have been summarily arrested by the dreaded intelligence "brigades." They are never heard from again. And it seems nowhere is safe. Jamal says that recently, a family he knows pinned up a rebel flag out of sight in their home. Somehow the intelligence services found out. "They stormed into the house, pulled down the flag, and arrested every man in that house," says Jamal. But the worst indignity of all, people here say, is they can't bury their dead. "The Gadhafi men. They come out and shoot you like cats," Mahmoud told me. "they hold their guns over you like this and shoot you like cats. We are not people to them." Regime officials will often then take the dead away, he says, not affording people a proper burial. "If we bury them, we must do it in secret." You'll remember she tried to tell her story to international journalists in a Tripoli hotel on March 26th. She said she'd been brutally gang-raped by 15 of Libyan leader Moammar Gadhafi’s troops. Eman Al-Obeidy was taken away by Gadhafi loyalists. She hasn’t been seen since. A Libyan government spokesman says she's alive. He promised that female journalists would be allowed to interview her in the next couple of days. Ahmad to Gadhafi: "If I were to see his face, I would strangle him"
TOBRUK, Libya (CNN) - Like everyone else, Aisha Ahmad watched the riveting drama unfold in a Tripoli hotel as a desperate woman burst into a dining room filled with journalists, sobbing, screaming, wanting the world to know she had been raped by 15 of Moammar Gadhafi's militia men. The arresting images of how swiftly the woman, Eman al-Obeidy, 29, and the journalists were stifled stirred viewers around the world. But perhaps none more so than Ahmad. This was her daughter. And she was enraged. Just weeks before, Ahmad might have wept in silence. But now, with war engulfing Libya and its future hanging in the balance, Ahmad feared Gadhafi no more. CNN Phographer Khalil Abdallah was eating breakfast in the hotel, when Aisha Ahmad's daughter Eman al-Obeidy burst in on Saturday. What happened next was unexpected and violent. Khalil, the CNN Photographer, told his story to Michael Holmes on Tuesday.